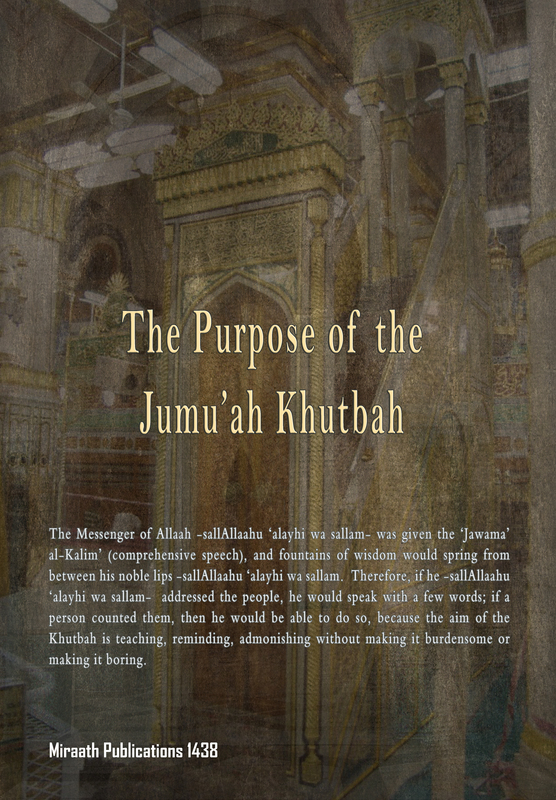 ‘On the day of Jumu’ah there is a Khutbah (sermon) the objective of which is to glorify Allaah and regard Him as Magnificent, and testify to singling out Allaah Alone as the Creator, and testify that His Messenger -sallAllaahu alayhi wa sallam- brought the message. Also to remind the worshippers about the Messenger’s days. To warn the people from Allaah’s torment and His punishment, and advise them with that which will bring them closer to Allaah and to His Paradise. Meaning that a person’s Fiqh (understanding) is known by this. Everything that indicates to an issue is a sign for it. Indeed the shortening of the Khutbah is a sign of understanding. This is because a Faqeeh (scholar of Fiqh – jurisprudence) is someone who researches the reality of the meaning of the texts [the Book & the Sunnah], and comprehensive wording, whereby he has the ability to express using eloquent and beneficial statements. The meaning of a long prayer is: where the one who prays does not come under the prohibited length of the prayer [meaning: extremely extending the prayer]. The Messenger of Allaah -sallAllaahu ‘alayhi wa sallam- was given the ‘Jawama’ al-Kalim’ (comprehensive speech), and fountains of wisdom would spring from between his noble lips -sallAllaahu ‘alayhi wa sallam. Therefore, if he -sallAllaahu ‘alayhi wa sallam- addressed the people, he would speak with a few words; if a person counted them, then he would be able to do so, because the aim of the Khutbah is teaching, reminding, admonishing without making it burdensome or making it boring. This is why the advice of the Messenger of Allaah -sallAllaahu ‘alayhi wa sallam- to his Companions was to shorten speeches, and at the head of that was the Khutbah of Jumu’ah. The Prophet -sallAllaahu ‘alayhi wa sallam- explained that the shortening of the Khutbah indicates to the good understanding [Fiqh] of a person. This was the instruction from him -sallAllaahu ‘alayhi wa sallam- and his guidance upon which he followed and continued upon. Even though the Messenger -sallAllaahu ‘alayhi wa sallam- used to sometimes lengthen the Jumu’ah Khutbah, generally it would be short. All Praises belong to Allaah, may His peace and blessings be upon our final Prophet Muhammad, his family, his companions and all those who follow his guidance.